Our transition started in June of 2014 with Reverend Breeden's retirement and will complete when we call a new minister to join our ministry team in 2016. New called minister arrives and joins ministerial team. Ministerial Search Committee presents candidate to congregation for a vote to be our called minister. Ministerial Search Committee prepares and conducts search. Board presents slate for Ministerial Search Committee for election by congregation. The congregation submits their nominations for the Ministerial Search Committee to the Board. A letter will go out to the congregation with details on how they will summit their nominations for the Ministerial Search Committee. Please join us for a Town Hall meeting on January 25th after the Second Service for more information and discussion. The board announces the process for forming the Ministerial Search Committee and announces the job description for its members. 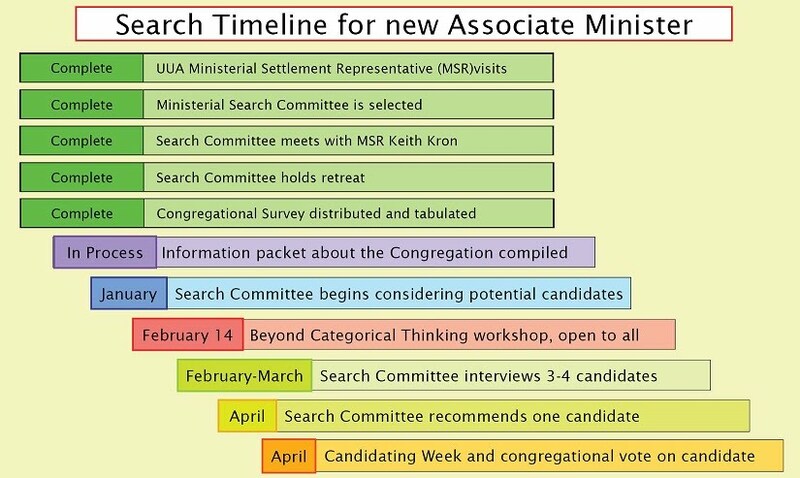 Board collects input from UUA and other congregations to determine process for selection of Ministerial Search Committee. Reverend Douglas Wadkins starts two-year term as part of ministerial team. Reverend Breeden retires and is voted Emeritus status by UUCB. Look for the timeline poster hanging in the church with photos taken from our journey. 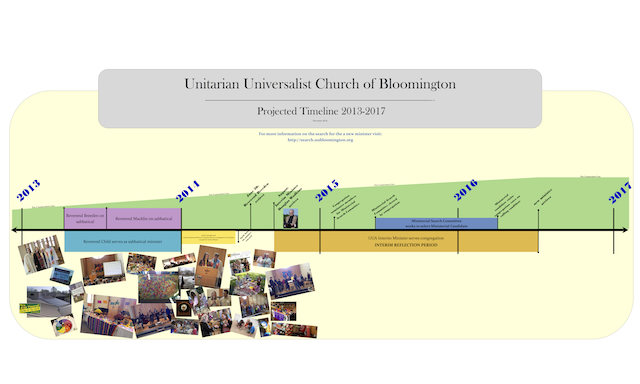 This site has information regarding the ministerial search for the Unitarian Universalist Church of Bloomington Indiana.